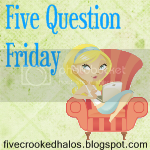 Playing along with Five Question Friday and Feeling Beachie's Four Fill In Fun! Long hot soak in the tub! 1. I love a wonderful man named Wayne! 2. If I could travel anywhere I would go on a tour of Europe! 3. When I grow up, I want to remember to take time for fun! 4. the best ice cream I ever ate is Daiquiri Ice from Baskin Robbins with Pineapple Sundae topping... yum!